“Travel To City” (TTC) is a project to help visually impaired for using public transportation. 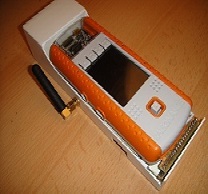 The main function of the device is to guide the traveler on the bus/metro public transportation line. For “Travel To City” device, the challenge is to allow the user to determine its path an adjust it according to the state of public transportation line. Just a word before the application description: You could file a documentation (pdf) and several video and pictures in the package file (.zip). All sources is available (I used a few function of previous project available on this website, thank very much for your help (forum , last contest and projects already enter)). I spent a lot of time to complete this project, I finish just today (14 december, deadline contest !!!). The application works (some point could probably be improved). I hope you like this project and it will be the start of another project. User interface is very simple, use ONLY the Evo joystick to function select. (joystick right and left to change item menu and joystick selection to select the current item). - What time is it ??? This function seeks the nearest public transport station around you. From this station, you could create a route. This feature allows you to create a route (from start station to destination station). You could select the start station and the destination station by joystick. All stations listed in alphabetical order. See in appendix 1 all stations listed for Grenoble. - Press joystick up and left to scan station (if you have selected the letter B you will listen for Grenoble: Bérivière, Bachelard, Bajatière, Basse Buisseratte, Bastille….). - Press joystick selection to select the current station. When the start station and the destination station are selected, the application will look the way. If the application has found a path, the navigation will start in simulation mode (“Go to the first station….” “take the line ….). At the end of navigation simulation, the application returns on the main menu. Select Navigation menu when you want to start the navigation in real mode. Follow the instruction navigation: ”Go to the station…”, “you approach to the station…”, “change of line….”. During navigation, you can replay the current instruction (message) by pressing joystick down. 1.1.2 What time is it? A simple function can give the local time by audio. (Hour and minute). This function send you position by SMS to a phone number save in the init application file. If the recipient of the SMS has a smartphone (like HTC hero (android) or IPhone), he can see your location/address (on Google map) by opening SMS (select the link). You can select a default language in init file. Note: The station name is all time in city language (French for Grenoble). Exit application (do not forget to turn off the external module).